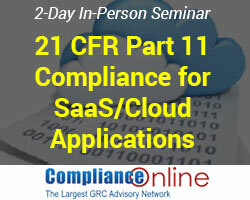 ComplianceOnline and subject matter expert, David Nettleton, will conduct a two day seminar on 21 CFR Part 11 Compliance for SaaS/Cloud Applications. PALO ALTO, CA, UNITED STATES, March 29, 2019 /EINPresswire.com/ — ComplianceOnline’s Seminar on 21 CFR Part 11 Compliance for SaaS/Cloud Applications returns to Arizona and Philadelphia in 2019. The 2018 sold-out event was attended by various healthcare and pharma professionals representing FDA regulated organizations such as Abbott Laboratories, Genentech, Novo Nordisk Inc., Sanofi Pasteur, Cancer Treatment Centers of America, Vital Therapies, Inc., BioLife Solutions, and others. The two-day training program led by well-known FDA compliance specialist David Nettleton, will explore proven techniques for reducing costs associated with implementing, using, and maintaining computer systems in regulated environments. Lack of proper system validation is one of the major reasons for Warning Letters and 483s in most of the FDA regulated industries. This two day seminar will help participants understand the specific requirements associated with local and SaaS/cloud hosting solutions. It will address the latest computer system industry standards for data security, data transfer, audit trails, electronic records and signatures, software validation, and computer system validation. Seminar instructor David Nettleton is an industry leader, author, and teacher for 21 CFR Part 11, Annex 11, HIPAA, software validation, and computer system validation. He is involved with the development, purchase, installation, operation and maintenance of computerized systems used in FDA compliant applications. He has completed more than 230 mission critical laboratory, clinical, and manufacturing software implementation projects. This in-person training will assist regulatory affairs personnel, software managers, QA/ QC teams, software vendors and suppliers and others within an organization.